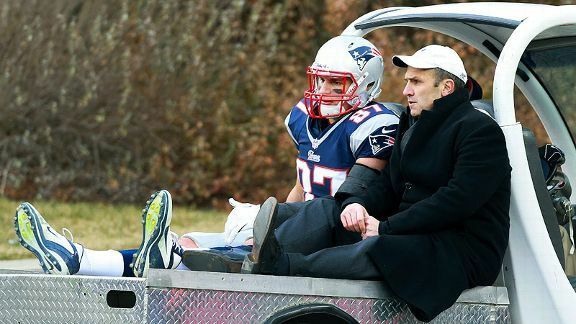 Gronk was just the latest victim. Why are ACL tears on the rise? To be honest, it doesn’t look like much. It’s short, just over an inch in length, and stubby, about half an inch wide. It is white, slick, and striated like a cluster of angel-hair pasta. It isn’t rubbery, and it doesn’t have much elasticity. In fact, you wouldn’t give it a second thought — not until it self-destructed, which it occasionally does, always at the most inopportune of times. And then you wouldn’t think about much else but that gremlin that now sits at the center of so many of our games. It was there when Kansas City Chiefs safety Bernard Pollard dove at Tom Brady’s knee on the 15th offensive snap of the Patriots’ season in 2008. It was there in December 2011 when Adrian Peterson went up the middle for three yards in the third quarter. It was there when Derrick Rose landed awkwardly during the first game of the 2012 playoffs, making him grimace in agony and sending him to the sidelines for over a year. It was there two years ago when Mariano Rivera was shagging flies in Kansas City and tripped over the apron to the warning track, ending his season. It was there just this last weekend when Cleveland Browns safety T.J. Ward crashed into the knee of Patriots tight end Rob Gronkowski. It has been there for Mickey Mantle, Wes Welker, Jerry Rice, Ricky Rubio, Donovan McNabb, Craig Biggio, and Tiger Woods, to name just a handful. That gremlin is always there — just waiting to pop. Lately, though, it seems to have been acting up a lot — so much so that one might even say the three most important letters in sports are not NFL, NBA, MLB, or NHL but ACL, as in the dreaded anterior cruciate ligament, that little bundle of collagen right at the center of your knee. It is that bundle that tears apart, leaving athletes to scream, cry, and pound the turf or court in frustration and torment. There are nearly 400,000 ACL repair procedures each year in the United States — a disproportionate number of them for women, who are seven or eight times more likely to tear their ACLs than men. If there has been an uptick in ACL injuries among the general population, says Dr. Brian Cole, the Chicago Bulls’ team physician and the surgeon who performed Derrick Rose’s reconstructive surgery, it is because more people, especially young people, are participating in sports. “You’re seeing more exposure to high-risk activities,” says Dr. Cole, “and you’re seeing a different level of athleticism that’s probably contributing.” But that’s the general population — you and me. Among professional athletes, the number of ACL injuries has soared. When Rose went down with his ACL tear, he was, according to Basketball Prospectus, the first true star to have done so since Danny Manning tore his ACL in 1995, and Manning was the first since Bernard King tore his in 1985. Then came the deluge. Though the NBA refuses to release information on ACL tears, by one tally, seven guards suffered tears after Rose, including Iman Shumpert, who tore his the same day as Rose; Rajon Rondo; and Leandro Barbosa. Ricky Rubio tore his ACL just a month before Rose. Where the number of tears seems to hit epidemic proportions is in the NFL. Professional football doesn’t release ACL figures, either, but Kevin Seifert of ESPN.com discovered that as of October 23, 30 players had been placed on injured reserve because of ACL tears — topping the 25 for all of 2011 and edging close to the 32 for all of 2012. As early as this year’s NFL training camps, ACLs were snapping all over the place. But here is the thing about ACL tears: They’re not just another injury. They are the Godzilla of injuries. They are painful beyond tolerance, they take eons to rehab, and they always leave a lingering doubt in the athlete’s mind that he will ever be whole again. An ACL tear tests one’s mettle. An ACL tear goes to the very heart of resilience and mental toughness. An ACL tear is the standard against which the athlete himself measures his determination. An ACL tear is the absolute limit. The ACL sits in the middle of the knee, in a notch on the femur or thigh bone on the top and in another notch on the tibia or shinbone on the bottom. It is between the medial collateral ligament on the inside of the knee and the lateral collateral ligament on the outside, both of which keep the knee from moving from side to side. It is in front of the posterior cruciate ligament, which keeps the tibia from sliding back behind the femur. (PCLs don’t rip much because — thankfully — there aren’t too many occasions in sports where the knee goes backward.) The knee itself is covered in front by the patella, or kneecap, a kind of cup that is connected to the femur by the quadriceps tendon and to the tibia by the patellar tendon.1 The function of all these parts is to hold the femur and tibia together so they don’t slip apart. Because if they do, frankly, you won’t be able to walk. Athletes talk about hearing the pop. Some describe it as a sound like a rubber band snapping. Some say you not only hear the pop the way you hear ordinary sounds, but that it travels up your body from the knee, so that your whole trunk reverberates with it. It doesn’t take much to “pop” the ACL, which is typically what happens when the ACL tears. Athletes talk about hearing the pop. Some describe it as a sound like a rubber band snapping. Some say you not only hear the pop the way you hear ordinary sounds, but that it travels up your body from the knee so that your whole trunk reverberates with it. There is no mistaking that pop. Just about every athlete knows immediately what it means. Dr. Cole says that for all the MRIs and other sophisticated tests devised to determine if one has torn his or her ACL, the surest sign is still the “pop” and the swelling that almost invariably follows when the blood vessels in the knee bleed into the joint. And, of course, the pain — the unbearable pain that knifes through your leg. It is not uncommon to think the pop is the result of violence, of a hit to the knee that jars it and snaps the ligament. And sometimes it is — to wit, Brady and Peterson. But the vast majority of ACL tears are not a product of contact. If you saw Reggie Wayne, all alone in the flat without a defender within 10 yards of him, turning to the ball and then suddenly crumpling to the turf during the Broncos-Colts game earlier this year, you know. Just about every ACL tear comes about when a player is twisting, trying to avoid contact or to deceive a defender, and then plants his leg in such a way that he has increased the torque on the ACL, bending it as it was not intended to bend. Essentially, it is the juke that will kill you. Dr. Robert Litchfield, medical director of the Fowler Kennedy Sport Medicine Clinic at the University of Western Ontario and part of the Canadian Alpine Ski Team medical group, studied videotape of ACL injuries and found a pattern. He found that those who tore their ACLs all did the exact same thing with their legs when they were avoiding a defender or reacting to an offensive player. “They throw it [the injured limb] out to the side, and they try to make an upper-body move where they move away from the side that they’ve just planted,” he says. “And they get to what we call a `point of no return. '” The knee misaligns, turns inward, and the athlete lands knock-kneed. That is when you hear the pop. That is why, Dr. Litchfield believes, an athlete like LeBron James will never suffer a tear. “When he comes down from a dunk, he comes down very low and powerfully versus coming down on an extended leg.” In short, LeBron’s legs are bowed, and athletes who bow their legs generally don’t tear their ACLs. The problem is that athletes in the heat of battle seldom think about how they plant or land. They just do it. And when they do, and their ACL tears, they are basically screwed. Or, to be more precise, they used to be screwed. If Derrick Rose had suffered his injury 20 or 30 years ago, his career would have ended because doctors wouldn’t have known what to do about it. Which isn’t to say that they hadn’t been trying for a long, long time. According to a French history of ACL surgery, the first ACL repair was performed in 1895 in Leeds, England, on a 41-year-old miner who had a load of dirt fall on him. What the doctor did was stitch the torn ACL ends back together, and the miner claimed he was good as new, though this seems highly unlikely. In 1903, a German doctor performed the first ACL replacement surgery using silk braids for the ligament. No luck. Fourteen years later, an English surgeon named Dr. Ernest W. Hey Groves performed the first ACL reconstruction surgery by harvesting the iliotibial band that runs outside the thigh from the hip to the shin and then affixing it to the femur and tibia with ivory screws. Though the operation was imperfect, that is pretty much the way it was until the 1960s. Then, a Dr. Kenneth Jones of Little Rock, Arkansas, began using the patellar tendon as a graft. It was primitive. Most surgeons opened up the knee, leaving gruesome scars. And the procedure wasn’t standardized. Every surgeon sort of did his or her own thing. What’s more, it wasn’t terribly successful, especially for athletes. It was designed to get patients walking, not faking out linemen on the field or centers on the court. In fact, the surgeons themselves were so distrustful of their own handiwork, so fearful their grafts would rip, they would immobilize the knee in huge casts for months after the surgery — which, as it turned out, only served to stiffen the knee, reduce its range of motion, and shrink the quad muscles in front of the leg. By the time the patients emerged from their casts, they had to rebuild their entire leg musculature from scratch. And that couldn’t be done. It was over. And then came Dr. William Clancy. Clancy had been recruited in 1974 to head a sports medicine program at the University of Wisconsin. While attending a lecture on ACL reconstruction by a Swedish physician, he had his Eureka! moment. Since Jones, just about everyone using the patellar tendon had left it attached to the tibia and then routed the tendon through the knee and fixed it to the femur. Clancy said he thought the patellar tendon should be harvested with bone blocks on each end, because it would be more flexible and stronger. He would then drill holes into both the femur and tibia, pull the tendon through, and attach the blocks through the holes. He felt this would more closely approximate the actual ACL. 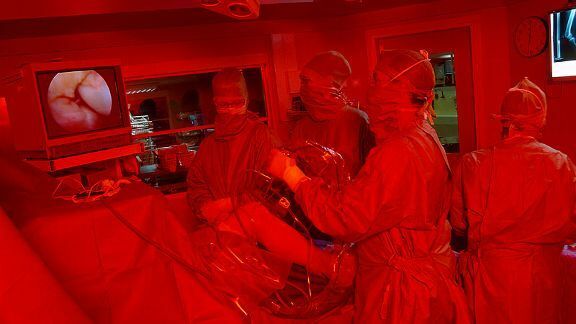 The “Clancy procedure,” albeit with all sorts of tweaks and refinements, remains the basic form of reconstruction to this day. It isn’t exactly the most exciting surgery. ACL reconstruction typically takes between 90 minutes and three hours, depending on the skill of the surgeon and the ancillary damage to the knee. Surgeons basically make a small incision (some make two or three), through which they harvest a strip from the middle third of the patellar tendon with the bone blocks at each end. (Some surgeons use hamstring tendons, and others use what is called an “allograft,” which is a tendon from a cadaver.) Then, working through tiny poke holes and guided by an HD camera, they remove the shredded ACL, drill the holes in the femur and tibia, pull the graft through the tunnels with a tiny metal probe, and fasten it at each end with bioabsorbable screws. In about eight months, the tendon “vascularizes” — that is, it is transformed into a ligament and becomes an actual, organic part of the knee. Though some have claimed a reconstructed knee will never be entirely normal, there is good news: The new patellar tendon is stronger than the original ACL. In fact, a Scandinavian registry shows that the rate of re-rupture after an ACL tear is only 10 to 12 percent, which is just about the same rate for an ACL tear in the other knee. But even with all the surgical advances and new medical knowledge, it isn’t easy to return to the pre-tear level. A University of Pennsylvania study found that of 31 NFL running backs and 33 wide receivers who suffered ACL tears between 1998 and 2002, one in five never returned, and those who did were one-third less effective in the three years after surgery. Another study, by Dr. James Andrews, the orthopedic surgeon who performed Adrian Peterson’s reconstruction, found that of 49 NFL players operated on at his clinic from 2001 to 2006, only 64 percent returned to action. Some outstanding backs, like Jamaal Anderson and Terrell Davis, never returned to previous form. The ACL can do that to you. And then there is Adrian Peterson, who has become the poster boy for ACL recovery. 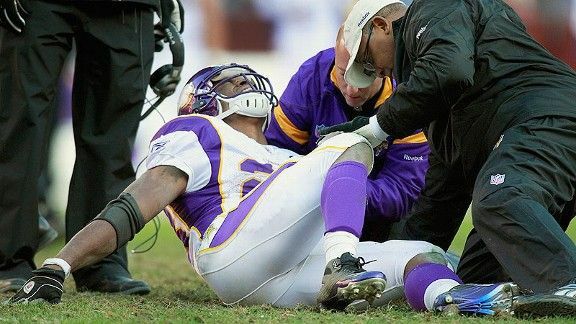 Peterson suffered his tear on December 24, 2011. If you had to have an ACL tear, it was nearly impeccable timing. Tearing his at the very end of the season meant he didn’t miss much time in 2011 and that he had a long time to rehab for 2012. And Peterson had another piece of luck, if you can call tearing your ACL luck. He only tore his ACL and MCL. He didn’t have a meniscus issue. As his physical therapist Russ Paine said, “Part of the reason for someone not returning back is not that they’re not trying hard, but it’s the status of the interior of the joint.” A bad joint makes it much harder. According to Paine, Peterson’s knee was pristine. Less than nine months after his injury, Peterson was back on the field. That, in itself, wasn’t so unusual. ACL tear recovery usually takes anywhere from nine months to a year. But almost every surgeon or therapist will tell you that when an athlete returns, it takes him awhile to regain his form, typically a year or so. Peterson didn’t just return to form. He began racking up yards, bulling over would-be tacklers, hitting the open field, bobbing and weaving and outrunning everyone. Peterson was a miracle. He finished the season just nine yards shy of the single-season rushing record and he won the MVP award. Not good as new. Better than new. That’s what everyone marveled at. In doing this, Peterson set a standard that would bedevil other ACL-tear sufferers. If he could do it, why couldn’t they? (This puts aside the huge question some have raised of whether Peterson had the assistance of PEDs.) Why did Derrick Rose, for example, keep resisting coming back last season when he was allegedly cleared to play by his doctors? Why didn’t all the ACL sufferers just man up the way Peterson had? The answer, simply: Every ACL tear is its own private hell with its own particular road back. Vikings trainer Eric Sugarman told the Minneapolis Star Tribune that Peterson was a “disaster” the first two weeks after surgery. “He was about as miserable as a human being could be. He was calling me late at night, texting me with hate messages. He didn’t shave. He lost weight. He hurt.” Sugarman devised an early exercise protocol — days after surgery, Peterson was on a stationary bike, as was Derrick Rose — and handed him off to Russ Paine of the Iron Man Sports Medicine Institute in Houston. That’s what he did with Peterson — worked him right up to the threshold. Peterson arrived at Paine’s facility at 10 days post-op and stayed six months. Each day he spent 90 minutes to two hours with Paine, then went off and did his core strengthening for hours more. This was the routine five, sometimes six days a week. Paine said other NFLers would watch Peterson and shake their heads in awe. Once Peterson’s quads began to come back — Paine says the quads “melt like butter” after surgery — he would work with Paine for three hours on range of motion and balance before going off to lift weights. Paine said the running back was a “monster” in the training room just as he had been a “monster” on the field. “ACL rehab isn’t about bigger muscles,” Paine says, “it is about muscle reeducation.” Peterson had to learn to get his muscles firing with his knee. He did. Less than a month after the tear, Peterson was off his crutches. By March he was running. By early May he was cutting. By May 30, he was racing teammate Percy Harvin. By September he was playing. But it’s what you don’t see in ACL rehab that counts just as much as what you do see. An ACL tear is not just a gremlin in the knee; it’s a gremlin in the brain. You have to convince yourself that you can be exactly who you were, and that is very hard to do. Expunging those doubts may have been the biggest part of Derrick Rose’s recovery. He didn’t want to have to think about his knee, and he had to reach the point where he wouldn’t. Clippers guard Jamal Crawford, who tore his ACL in 2001, said he walked with a limp for months even though he knew the reconstructed ACL was stronger than the original. The limp was in his head. As Dr. Litchfield, the Canadian ski team adviser, puts it, when an athlete doesn’t return to his sport, you assume something went wrong with the surgery and that he is physically impaired. But, Litchfield says, examinations don’t show any physical difference between those who return and those who don’t. The issues are likely to be psychological — the non-returners tending to be “higher-anxiety people or more cautious.” They just can’t bury that gremlin once and for all the way Adrian Peterson did. But Adrian Peterson, remarkable as he is, at least had ACLs. 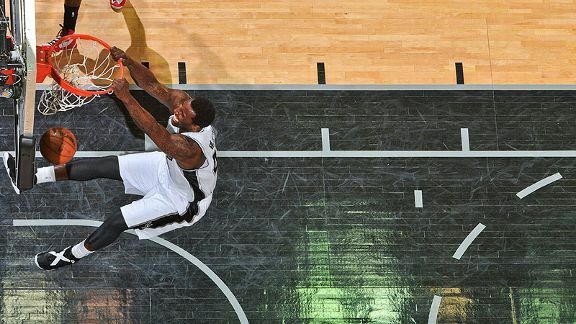 DeJuan Blair was already a schoolboy phenom in Pittsburgh when, the summer before ninth grade, he went up for a block and landed awkwardly on a concrete court, hearing the infamous “pop.” He had to crawl his way to the sideline, writhing. At the hospital, he was diagnosed with a bone bruise, but when he couldn’t walk, he got a second opinion: ACL tear. The Pittsburgh Steelers’ team physician performed his surgery. It was just about a year later, during the high school playoffs, that Blair batted the opening tipoff to an opposing player, raced down the court to block his shot, levitated, landed, and felt the pop again, this time in his left knee. He knew immediately. “That one was gone,” he remembers. There was another surgery. He was on painkillers for three months and would wake up in the middle of the night crying because he wasn’t sure he could make it back again. How blessed not even he knew. He became an All-American at Pittsburgh and runner-up to Blake Griffin as College Player of the Year, then left after his sophomore season to pursue his dream of playing in the NBA. It was at the draft camp in Chicago that his knees were X-rayed and the radiologist delivered the news: Blair had been playing without ACLs. Even Blair said he was “amazed.” He knew he had reinjured the knees, but said he had no idea he had actually torn the ACLs again. Charger quarterback Philip Rivers had played in the 2008 AFC championship game without a right ACL, Pittsburgh wide receiver Hines Ward had played without a left ACL. But no one had ever had a professional career without any ACLs. Of course, once teams heard, his draft stock plummeted. Expected to go in the first round, he fell to 37 and the San Antonio Spurs, where he played his way into the rotation. There are several theories of what enabled Blair to play when his knees should have been slipping and sliding. The most convincing is that Blair spent so much time building his quads, hamstrings, and calf muscles that they grew oversize enough to stabilize the knee. Blair himself says he had always worked diligently on his legs — at 6-foot-7 and 270 pounds, he is built like a Transformer — and that he never felt any pain after those first torments or played the game any differently from when he had ACLs. As for the mental part, since he didn’t know he didn’t have functional ACLs, there was nothing to overcome. Now he is on the Mavericks, playing solid minutes and putting up good numbers. He says, not unreasonably, that his life would make a good movie. We know the proximate cause of ACL tears: that odd foot plant and rotation. But that raises the question of why a trained athlete plants his foot that way when his body should be telling him otherwise — or why, when he does, the ACL can’t withstand the torque, when it seems to have been designed to do so. Theories abound. There is evidence that fatigue plays a role. Most ACL tears occur late in a game when an athlete may be running on fumes, and Dr. Cole, Rose’s surgeon, has published a paper demonstrating that in the NBA, tears typically happen in the second half to players who have heavy minutes. There is some evidence that ACL injuries increased with the rise of artificial playing surfaces, which are less forgiving to the knee than grass, and it is a fact that hockey players suffer fewer ACL tears than basketball, football, or soccer players, in part because they slide along the ice rather than plant, putting less pressure on the knee. Then there is the genetic explanation, which has been promoted by Dr. Tarek Souryal, team physician for the Dallas Mavericks. Souryal believes the real culprit is the size of the tunnel or notch within which the ACL sits. When the notch is narrow, the ACL has no maneuverability; according to Souryal, people with narrow notches are 26 times more likely to suffer tears, either because the notches are too small to accommodate a normal-size ACL or because small notches lead to undersize ACLs. (Other doctors dispute this.) In fact, DeJuan Blair said he was told that his ACLs shredded for precisely this reason: They were too small. Other studies show that members of the same family often suffer ACL tears, but doctors are loath to attribute this to genetics. It may be a familial factor — namely, certain families are more athletically active than others and thus more likely to find themselves in situations where they could tear an ACL. And then there is the neurological explanation. According to this analysis, knees have two types of stability: static (the ACL or a graft) and dynamic (the quads and hams around the knee). The quads and hamstrings must fire in concert to keep the knee stable and the ACL from rotating abnormally. But sometimes the muscles don’t fire in concert. Sometimes the synchronicity is off and the muscles don’t compensate for the stress on the ligament, which is what one recent study concluded. Another study found a “latency” in the hamstrings — meaning the hammies were slow to react to a force — and concluded that this contributed to ACL “deficiency.” These studies are especially relevant to female athletes, who are so much more likely to suffer ACL tears than men. The reasons, again, are variable: small notches; a skeletal structure that angles knees inward, especially upon landing after a jump, and inclines tibiae backward where they are less able to take stress; even hormones. The only upside, says Russ Paine, is that, at least anecdotally speaking, women seem to rehab better than men do because, Paine attests, they are just plain tougher in the training room. But there is something else that may help account for the increase. Doctors and trainers call it “proprioception.” Proprioception is how an individual perceives the relationship of the various parts of his or her body to time and space. It is a mind-body issue. Your proprioception is what allows your brain to coordinate everything, including your muscles and ligaments, so you can function smoothly. But proprioception requires instantaneous reactions, and it can be off, especially when a body faces new challenges and stresses, as an athlete’s generally does. Proprioception is the reason, according to Dr. Brian Cole, why ACL tears almost never occur when an athlete is practicing by himself or is on the court or field in isolation, but almost always while reacting to an opposing player. (Even Reggie Wayne’s cut was anticipatory.) Proprioception requires a player to predict where his body should be in relation to that opponent. When a basketball or football player fails to accurately predict his position in space, when the brain doesn’t send an accurate signal to the joints, the knee is likely to be in a compromised position and the ACL cannot adjust. And as athletes have gotten bigger, faster, and stronger, and as the games have required more deception, proprioception has had to become much more sophisticated. So it’s not just the ligament that fails — it’s our whole personal navigation system. In a sense, we are victims of ourselves, which makes ACL tears not only a physical challenge but also a metaphysical one. Kaya Turski doesn’t much resemble Adrian Peterson or DeJuan Blair. She is a sprite, only 5-foot-5 and slight of stature — things that help her fly through the air, which is what she does. 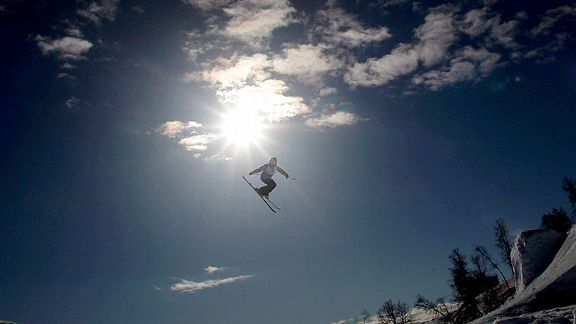 Turski happens to be the five-time world slopestyle skiing champion. She is the woman at the very apex of her sport, which will be included next February in the Olympics for the first time. And if she is a revolutionary in her sport, she is also a revolutionary in ACL surgery. By now, you’ve probably guessed that Kaya has suffered an ACL tear. Actually, she has suffered a few. She got the first after she was recovering from a pancreatic injury in 2007. Just 14 days after she got back on her skis, she was training in New Zealand when she attempted a 50-foot jump, landed, and felt her right knee give. “It’s crazy how loud that pop is,” she remembers. And she knew immediately that her ACL was gone. As it turned out, her MCL and LCL were, as well. But she had a hamstring graft, went through a grueling rehab, and returned to the slopes nine months later. The second came in April 2010 when she was making her third run in a competition she had already won and was attempting a new trick — a two-and-a-half forward rotation. As soon as she landed, she knew her left knee had gone. But once again she came back, and she felt stronger than ever. Then came the third, just last August while she was training in Oregon and lost her bearings in the air during yet another trick. She was just six months out from the Olympics, where she would have been a favorite to medal. If she’d had normal reconstructive surgery, there would have been no hope of her returning in time for Sochi. She considered competing without her ACL. But instead she did research and came up with an idea: She proposed getting a synthetic graft. Synthetic grafts had been pretty much discredited, in part because while they might work in the short run, they invariably fail in the long run. Still, she knew it was her only chance, and Dr. Litchfield, recommended to her by a fellow skier, reluctantly agreed — because Turski told him the Olympics were likely to be her swan song, and it didn’t matter to her if the graft held afterward. But he agreed with a proviso. He would wrap the synthetic ligament in an allograft, a ligament from a cadaver, so that Turski would have a chance of avoiding a revision surgery after she retired. It is, to her knowledge, the first time this has ever been done. 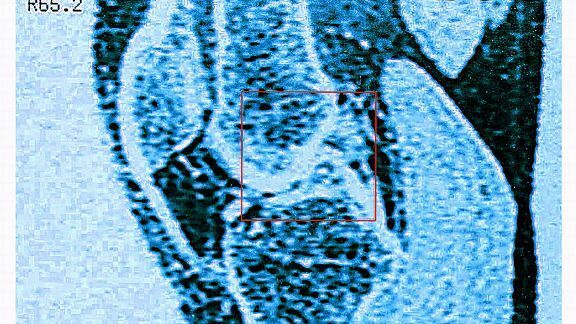 As it turns out, there is another ligament in the knee — one just discovered by two Belgian doctors this year, believe it or not. It is called the “anterolateral ligament,” or ALL, and it is located at the front of the knee. The Belgians suspect that the reason some ACL tears wind up re-tearing is that doctors hadn’t repaired anterolateral ligament damage that may accompany ACL damage because the doctors hadn’t even known the ALL existed. Though, to be fair, dogs also tear ACLs, which may lead one to conclude that the ACL may just be God’s gaffe — the lemon of the body.